Since Monday we have been in Alabama visiting our friend Sean and his gal Grace. It's beautiful down here, and it is a shame to think that due to the massive oil spill that it may not be this beautiful when we come back. Today just so happens to be Sean's birthday. 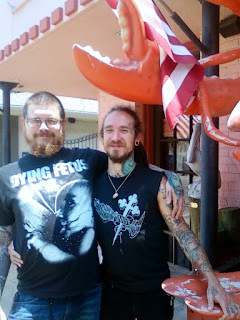 We woke up, went to a place called Old Bay Steamer for lunch, had some amazing seafood and super yummy mojitos. I also made Sean a birthday cheesecake, a VEGAN birthday cheesecake. 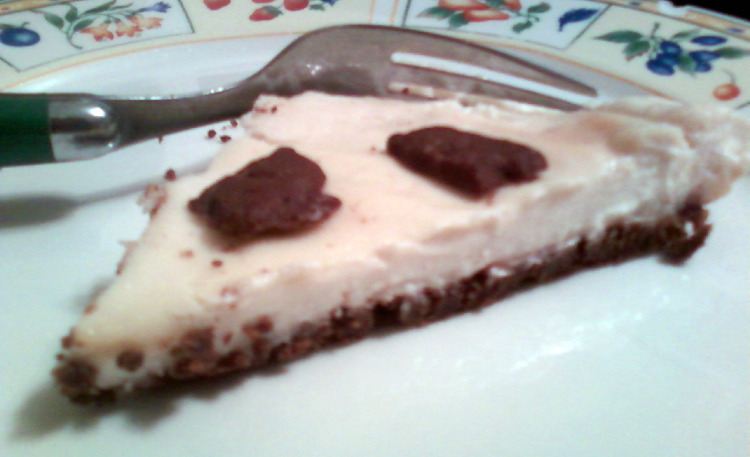 Not sure if you've noticed, but I kinda like baking vegan cheesecakes, the first one was so good, so why not? I'm up for a challenge! I have to admit that after two mojitos I was feeling 'good', so it's a good thing we walked ;) I was still totally up for the challenge for baking another tasty Vegan cheesecake. So when we got back to the house and relaxed a bit, it was on like donkey kong. Jason wanted the chocolate peanut butter cheesecake not too long ago, but luckily I was able to make something different. This one is a vanilla cheesecake with a chocolate graham crust, and for added cuteness I put some chocolate graham bunnies on top. The cuteness added to the taste, it's DELICIOUS! Preheat the oven to 350 degrees. In a medium size bowl combine the cookie crumbs and the melted butter. Mix together with a fork until all crumbs are moistened. Press into bottom of a 9 inch pie plate, set aside. In a large bowl whisk together the tofutti, sugar, vanilla, and soy milk until well blended and smooth. Pour into crust and bake for 30-40 minutes until top is slightly browned and middle is still soft, but not jiggly. Cool for 10 minutes, then chill completely. I put this one in the fridge for 3 hours, then in the freezer for 1 hour and it was awesome. Alabama was amazing, Jason and I had a blast. Sean and Grace are amazing people, and we are very fortunate to have them in our lives. Yay!! Another AMAZING vegan cheesecake! Thank you sooooo super much for posting this. I just printed it out. And DOUBLE-YAY for your trip to see Sean and Grace. What an incredible bunch of people right there - all together for a special birthday. Great photos. I hope I can hang out with you all one of these days.